The intense hard work has its fruit of success reaped now. Vishal-Action King Arjun-Samantha starrer Irumbu Thirai completes 100 days and it’s turning to be a moment of celebration for everyone in the team. A strong theme, well executed presentation and powerful performances have been the most ascribing elements for this film’s success. With the shows running house packed even on its 100th day, it’s much more off joyful domain for the producer, exhibitors and distributors. Marking this special occasion of 100 days celebration, a grand event will be held amidst fans on August 29 at Kalaivanar Arangam in Chennai. In addition, it will be a ‘Double Celebration’ mode as Vishal celebrates his birthday on the same date. Vishal’s Irumbu Thirai was released on May 11 2018 and opened to positive reception among general audience and film critics. PS Mithran made his directorial debut with this film, which had a premise involving cyber-crime and darker side of digital space. 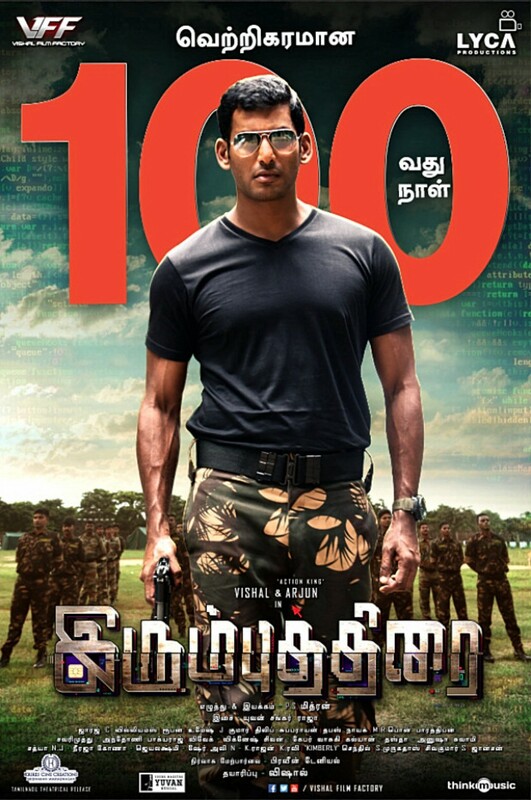 An unparalleled performance by Vishal, Action King Arjun, Samantha and almost everyone in the cast along with the technical brilliance of Yuvan Shankar Raja (Music), Ruben (Editing), George C Williams (Cinematography) and others become a standout highlight.